ENGINEERS: Sci-Tek Consultants, Inc.; WBCM; WNA Engineering, Inc. DESCRIPTION: Formally described as a bunker, this project transforms a brutalist 1962 building into an inviting destination for a diverse community. The deeply recessed entrances were moved forward to provide ample glazing that facilitates views to the street and daylight to the interior. Small additions at the front and side of the original building maximize the interior plan, providing a dedicated area for teens and expanded children’s area with an outdoor deck. JURY COMMENTS: With minimal moves and thoughtful details, the bunker-like building has been transformed into a welcoming living room for the community that engages the street. The perforated phenolic panels introduce a welcome sense of mystery and engagement within the existing tectonic of the original structure. The care with which the architects have transformed the building will have an outsized impact on everyone who visits the library. ENGINEERS: BuroHappold Engineering; Civil & Environmental Consultants, Inc. DESCRIPTION: Motivated by the belief that waste is the inefficient use of resources – financial, environmental, or human – PNC set out to create an innovative workplace that fosters collaboration. 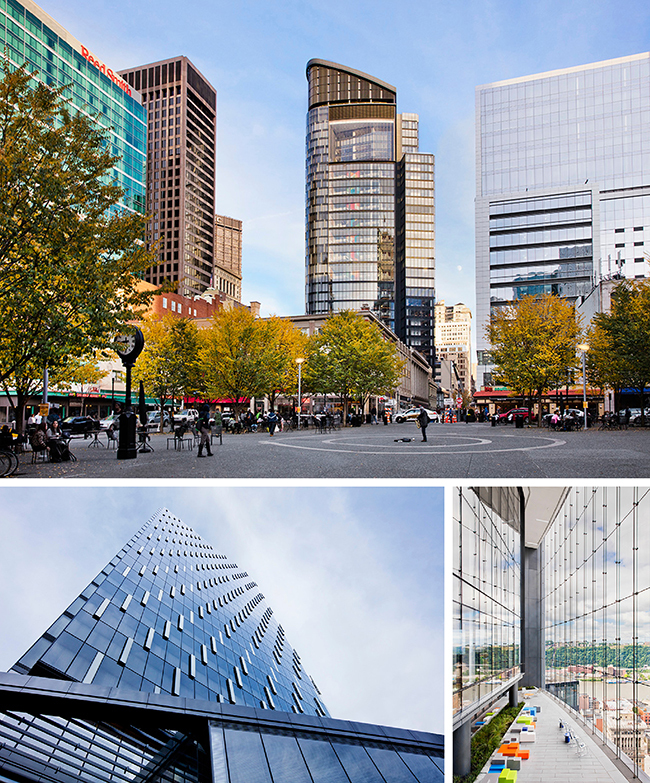 Although building rises vertically, ground level orientation forges a connection to adjacent PNC Plaza and offers a direct route to Market Square. Inside, two-level workplace ‘neighborhoods’ create micro-communities to connect people at a familiar scale. The Tower has also been orientated to true south to maximize natural sources, increasing daylight, reducing glare, and controlling solar heat gain. 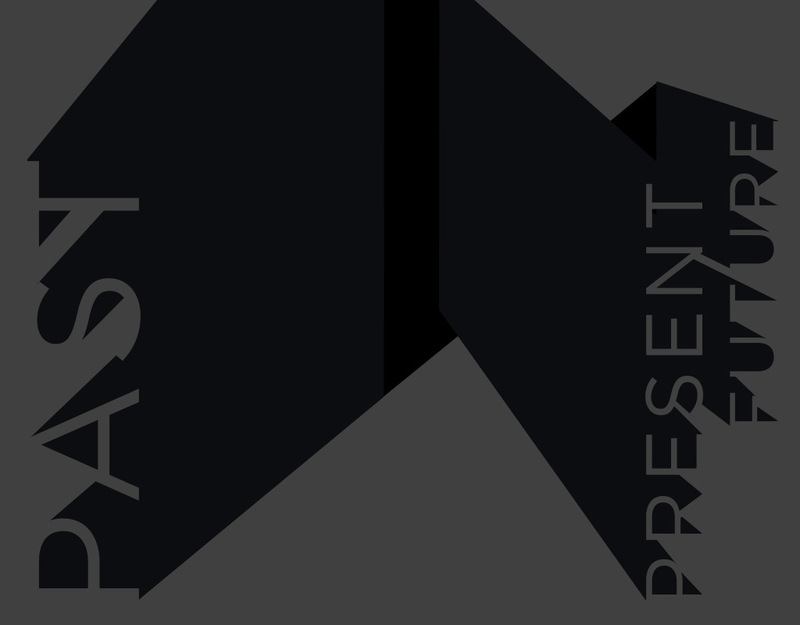 JURY COMMENTS: The work acknowledges the pre-existing context while at the same time ultimately changes that context. 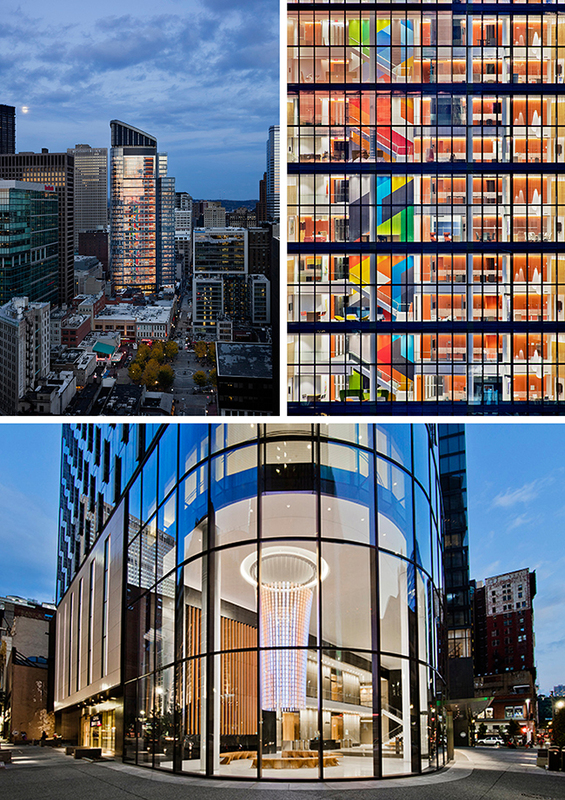 The vertical deployment of color through transparency becomes a defining element for this work. The design team has been sensitive to the nuances of place and precedent. This project is deeply responsive to content, material, and its cultural, historical, and physical environment. This is a successful building on many levels, embodying a powerful sense of purpose, place, and tectonic. ENGINEERS: Iams Consulting, LLC; K2 Engineering, Inc. DESCRIPTION: Located on a farm near Frank Lloyd Wright’s famous residence, four modest units and a screened porch have been added to an existing cabin that accommodates Fallingwater’s summer programs. By leveraging the functions of the existing cabin, resources were focused on creating new sleeping units and an indoor/outdoor gathering space. This solution allowed the Conservancy to double the reach of its programming while keeping within budget and with minimal disturbance to the natural site. 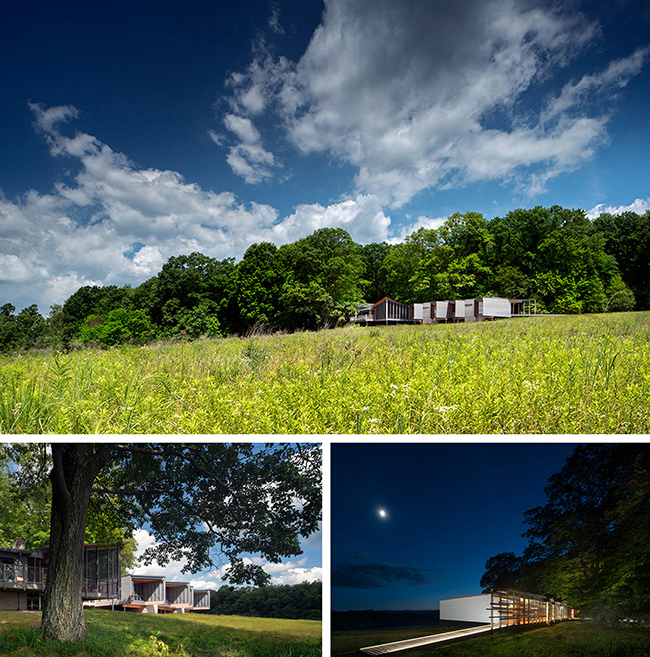 JURY COMMENTS: This is a well-crafted project that elegantly sets itself along the edge of the landscape. The reuse of the spruce material from the site was thoughtfully considered as a thread linking the project’s components. The development of the parti as an extension of the path linking Fallingwater through the landscape was also particularly successful. Great presentation and photography. ENGINEERS: Lovorn Engineering Associates, LLC; Barber & Hoffman, Inc.; Civil & Environmental Consultants, Inc. DESCRIPTION: After a traumatic event brought critically wounded patients and community members into the hospital, patient transport was identified as a primary concern, as there was no patient-dedicated elevators that could provide a direct connection between departments. A new elevator tower project was conceived to transform the vertical flow of the hospital. JURY COMMENTS: The elevator tower and addition deftly connect and transform the hospital complex in a manner, which is both beautiful and highly functional. The new addition creates a dialogue, and the resultant conversation allows one to see the former building in a new way. The color, materiality, and transparency of the new anodized aluminum panels complement and elevate the existing brick buildings, bringing the existing hospital forward with new relevance. DESCRIPTION: Floriated Interpretation is a retail space for a local garden nursery, designed to be able to store dry goods in the spring, shade sun-sensitive plants in the summer, and protect plants from freezing over the winter. The existing office shed is connected to the new retail area with a porch and common roof. The structure was prefabricated in a warehouse as a kit of parts; it is a site-specific iteration of a product intended for mass production. JURY COMMENTS: It’s a project with a low budget that creatively gives a new face for a community retail space. The engagement of the community in the development of the project gives it a character not often seen in architecture projects. 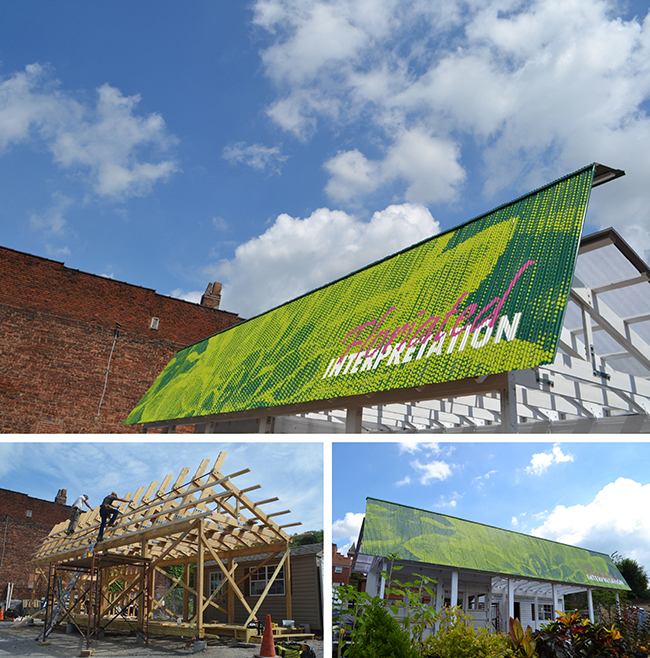 There is a clear understanding that this project is a billboard in its construction, symbolism, and message that it transmits to its community. DESCRIPTION: The ADAPTIVE Kitchen is a prototype kitchen being developed for an underserved minority – disabled veterans – specifically to serve those with lower limb loss, visual impairment, and limited mobility. The NavADAPT LAB was developed to prototype and test components of adaptive and augmented spaces for application into the ADAPTIVE Kitchen. The flexible, systems-based shell houses all of the technical equipment needed to support the lab’s function as a research and development platform. Both the NavADAPT LAB and ADAPTIVE Kitchen are part of a series of projects attempting to provide quality, affordable housing for Pittsburgh’s veteran population. JURY COMMENTS: The research and work that have gone into the development of the human-centered NavADAPT LAB are impressive. This is a compelling study towards ‘Real Time’ prototyping as well as making design available and more accessible. This kind of project could have limitless possibilities in advancing architecture in the realms of technology, prototyping, and social impact design. PHOTOGRAPHERS: Kristina Helen Schmidt of KHS and Co. 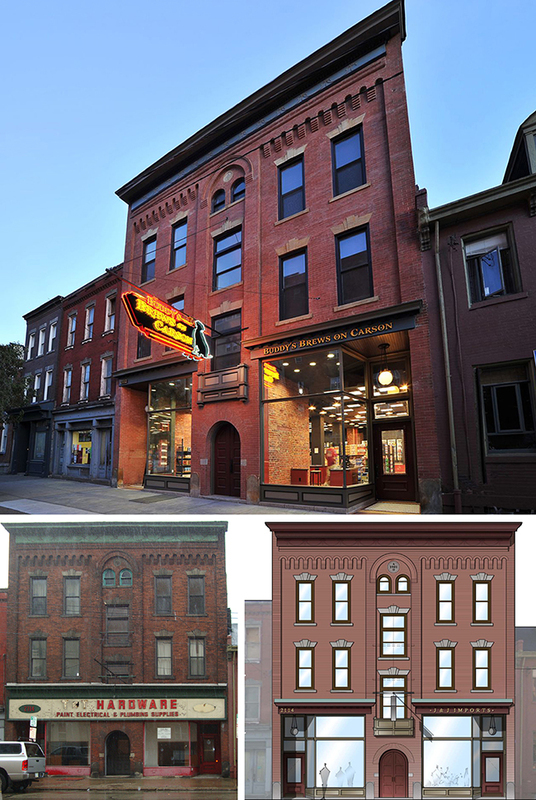 DESCRIPTION: This project tackled the restoration of the original facade of a three-story, early 20th century building located within the East Carson Street Historic District in Pittsburgh’s South Side. Hidden gems, including transom windows and evidence of a balconette, were discovered during the removal of existing signage. JURY COMMENTS: Historic projects can be very complicated. This project makes the complexity look simple and reinvigorates the façade with beautiful storefronts. The design team focused and leveraged the best aspects with powerful effect; the balance of openness, scale, and delicacy of the storefront within the masonry framework is extremely successful. DESCRIPTION: The 21c Museum Hotel Lexington restores and reemerges four adjacent commercial buildings at the historic center of downtown Lexington into an 88 room hotel with 7,000 square feet of gallery space, a signature restaurant, and event and meeting spaces. 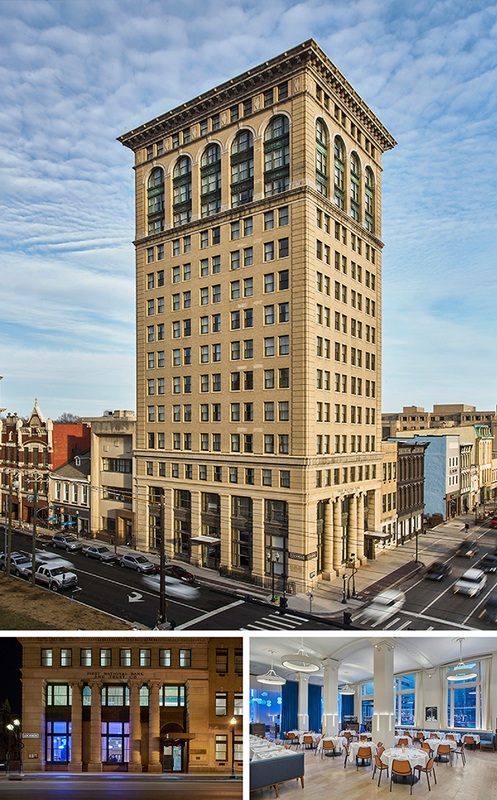 The ensemble of buildings include the 1913 First National Bank Building, Lexington’s first skyscraper; two adjacent bank annexes; and the Fayette Building, constructed in 1872. The goal for the transformation was to find an effortless relationship between these original structures and contemporary design for the building’s new program. JURY COMMENTS: This is an extremely complex project! The ‘sleeving’ in of this program within the maze of requirements from NPS and SHPO deserves recognition. The design team truly valued the past as an inspiration to invent the future. The creative expansion of interior space on the ground floor belies its traditional outward organization on the block. While a wonderful addition to the 21C portfolio, the real winner is the city of Lexington and its future patrons. 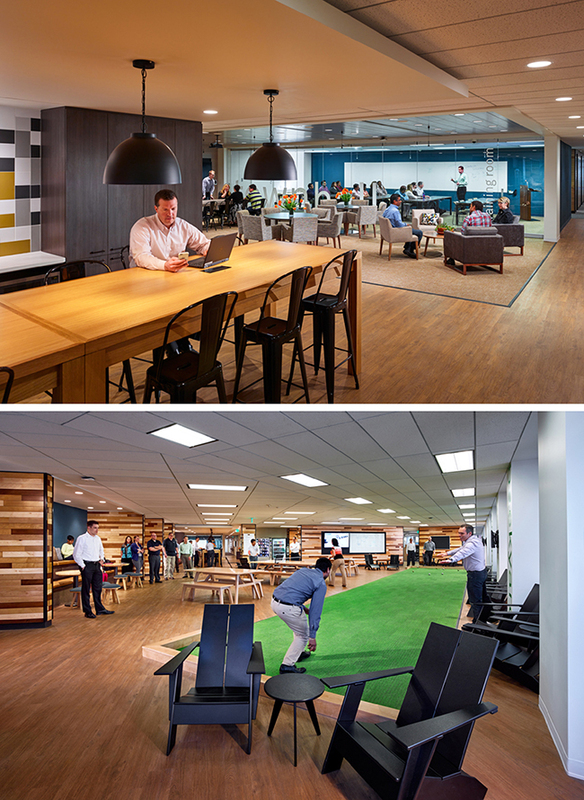 DESCRIPTION: Building 37 takes an abandoned big box store and upcycles it into a vibrant workplace, addressing the client’s urgent demand for space and sincere commitment to stay within the Baltimore community. 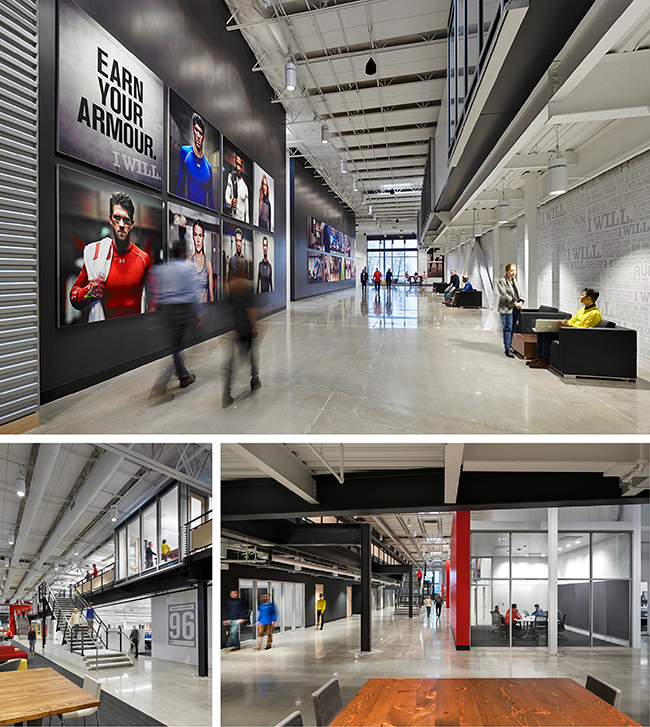 The project reuses the shell and structure of the existing 130,000 sf facility, while adding a mezzanine level to increase total occupiable capacity to accommodate 650 employees, a 350-seat auditorium, food service, and fitness amenities. JURY COMMENTS: This project is a prime example of the many opportunities and benefits that can be found in repurposing vacant big-box retail spaces. The mezzanine is deployed creatively to create density and spatial modulation, leveraging the existing retail condition. 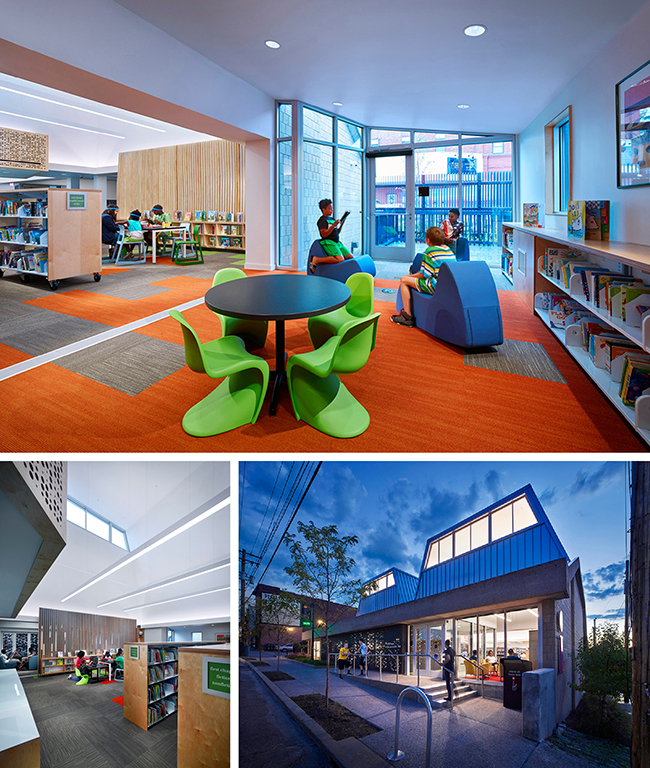 The program has been effectively deployed around a communal volume of ‘found space.’ Using a simple material palette, lighting variations, and bright colors, the architects did an incredible job of transforming the original structure into an energizing, state-of-the-art work environment. It’s expertly edited, narrated, and presented. 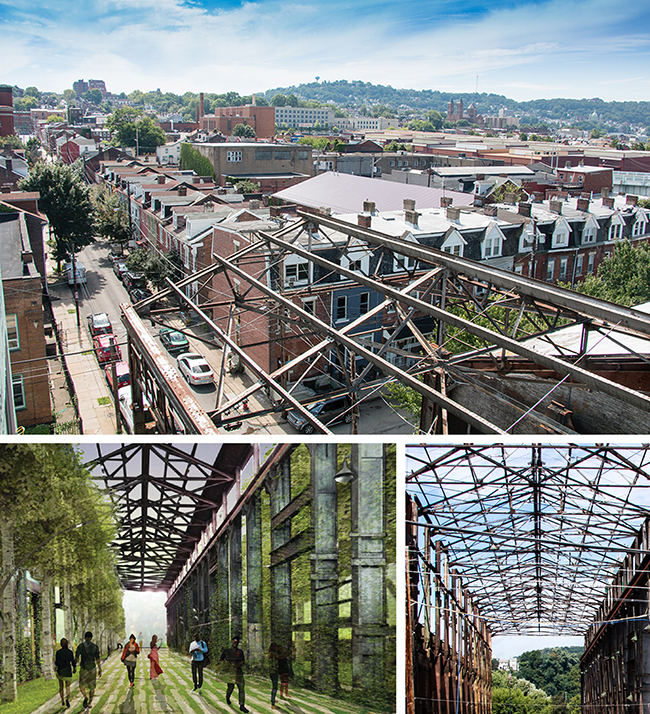 DESCRIPTION: Despite population loss, economic disinvestment, and the destabilization of the social fabric, the Hill District community has proven resilient. 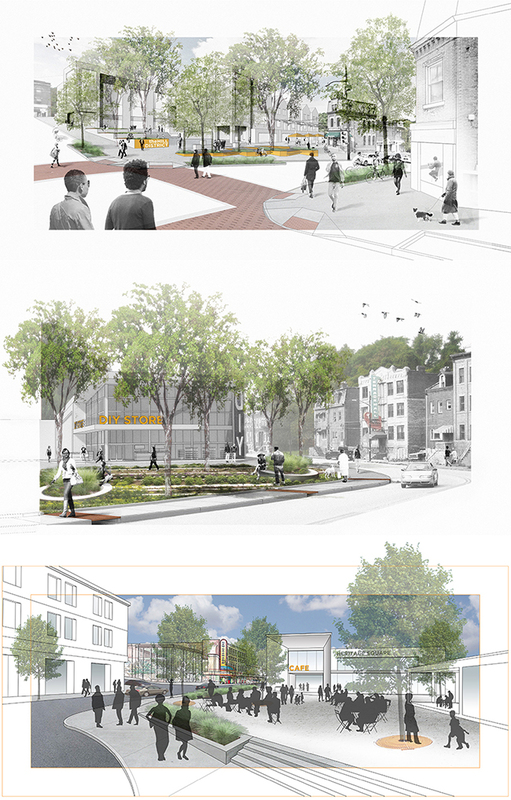 The Centre Avenue Redevelopment and Design Plan highlight this as Centre Avenue is reimagined as a place of exchange – where residents come to meet, visitors are welcomed, institutions share resources, and businesses showcase their offerings. Historically the Hill’s main business corridor, the Avenue will be reborn with defined “Centres” of Culture, Opportunity, and Cultivation. JURY COMMENTS: This project is an excellent study looking at the complexity of urban design. It clearly defines a strategy to do smaller interventions that can transform the community over time. By focusing on several small interventions along an urban path, the team has envisioned a realistic timeline for growth and transformation. The jurors were struck by the use of time as an integrated design tool. The community engagement process was simply and powerfully communicated in this submission. DESCRIPTION: This former industrial property acted as a barrier between Lawrenceville and the Allegheny River. Historical maps revealed that one of the industrial bays aligned with a neighborhood street. Through careful demolition and the peeling away of the metal skin, an iconic monument to the steel industry was revealed, providing a new civic space and dynamic pedestrian connection for public use. JURY COMMENTS: This is a wonderful narrative and discovery of a purpose built structure and its transformation. Utilizing an internal armature as a ‘bridge’ to the river—an urban stitch enabling public connection through a future development— it became a powerful icon of the past as a vision to the future. It’s an interesting tenant and study for how we define and value existing conditions for future development. ENGINEERS: Buro Happold Engineering; Civil & Environmental Consultants, Inc. DESCRIPTION: This project rethought traditional design and performance of a high-rise building and considered how to give control to individual users while trying to minimize the use of natural resources. Shifting the building facade off the city grid maximizes daylight while a solar-powered chimney draws in fresh air and exhausts hot air, creating natural ventilation without energy use 42% of business days within a year. Design strategies throughout minimize resource use and connect the company and its employees to their urban context, local climate, and environment. JURY COMMENTS: This project emphasizes a message of sustainability, not only through the selection of materials and methods, but also by creating a civic work that will meet the evolving needs of client and community. The project beautifully integrated individual sustainable strategies within larger sustainable building goals. 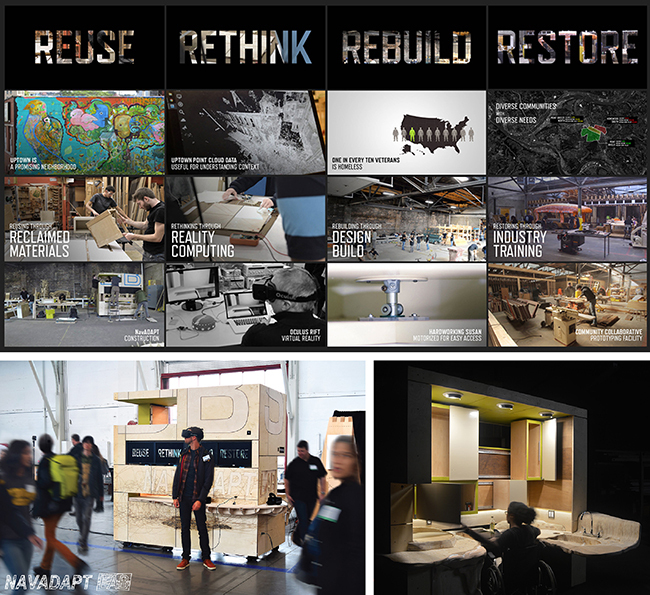 The project transcends ‘sustainable’ guidelines for high performance – high design ideals. DESCRIPTION: The SRO Village is a transitional housing community that gives each resident a home, access to food producing plants, and a community market. The intention is to give them a sense of purpose through cultivation and economic reintegration through selling their produce in the market. The Village can stand as an existing place for the homeless or react to a catastrophe by providing housing and food to the displaced. The structure is designed simply as an aggregate of units, with the ability to grow or shrink based on demand. JURY COMMENTS: This is a design solution, which is about more than aesthetics; it combines ideas that are relevant and pressing in an attractive solution that is both simple but experientially rich. It’s based in reality, and is meaningful and sustainable. By addressing a mix of resiliency issues, both socio/economic and physical, in a robust and efficient way, it is evident that the designer has an acute understanding of resilience and the needs of vulnerable populations, giving people a sense of community and purpose. It’s sustainable and socially rich. It’s also adaptable and transferable and works for a variety of neighborhood and urban settings and for a variety of occupants and disenfranchised populations. This design mixes the community with the marketplace and could even create a place out of a parking lot. This could really go somewhere!